The power of the image in presidential politics was never better demonstrated than in September 1960. That was when John F. Kennedy supposedly won the first-ever televised debate between U.S. presidential candidates because he appeared so poised, rested, and telegenic compared to his sweaty, haggard-looking rival, Richard M. Nixon. Most television viewers thought so, supposedly. But people who listened to the debate on radio had a distinctly different impression: They thought Nixon won the encounter. So goes one of the most delicious, enduring, and often-repeated myths about the American media and politics, which was served up yesterday in a commentary posted online yesterday by Canadian-based Troy Media. The myth of viewer-listener disagreement — that television viewers and radio listeners had starkly different impressions of the inaugural presidential debate — was destroyed (or ought to have been) in research published in 1987 by David L. Vancil and Sue D. Pendell. They noted that reports of viewer-listener disagreement were thin, flawed, and anecdotal, and the few surveys that hinted at a viewer-listener disconnect were too small and unrepresentative to allow for confident assessments. Vancil and Pendell’s research also challenged the notion that Nixon’s haggard look much contributed to views about the debate. It’s revealing to note that a good deal of post-debate commentary deemed the encounter a draw. Right after the Kennedy-Nixon encounter, the Associated Press conducted an unscientific survey of 100 Americans in 10 major U.S. cities and reported that most respondents said they weren’t influenced by the exchanges. 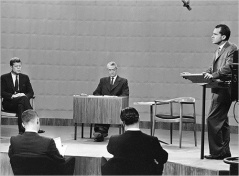 And it was hardly the case that “a large majority of television viewers recognized Kennedy as the winner” of the debate, as the Troy Media commentary claimed. A Gallup poll conducted during the week after the debate and released October 11, 1960, reported that 43 percent of voters thought Kennedy “did the better job” in the debate; 23 percent thought Nixon was better, and 29 percent said both candidates were about the same. Five percent offered no opinion. The survey, moreover, detected no marked shift of support to Kennedy, post-debate. The survey reported Kennedy to be narrowly ahead, by 49 percent to 46 percent, with 5 percent undecided.